New Jersey’s statewide forest cover figure of approximately 42% (New Jersey Forest Health Highlights 2014) tells us that its residents place a great deal of value on their tree canopy. That figure is a true testament in the most densely populated state in the nation and one that has seen devastating impacts to that tree cover from Hurricanes Irene (2011) and Sandy(2012). The gypsy moth, bacterial leaf scorch, gouty oak gall, Asian longhorned beetle, southern pine beetle, the hemlock wooly adelgid and the emerald ash borer are all currently being monitored and manged in NJ forest lands. More than one thousand non-indigenous plant species have become established in New Jersey, crowding out native species and disrupting ecosystem functions. The most problematic of them include purple loosestrife in the wetlands, autumn olive, multiflora rose and Japanese barberry in our forests. Other species of special threat include: Norway maples, Ailanthus Altissima (tree of heaven), garlic mustard, and the porcelain berry and Asian bittersweet vines. Improper tree selection and maintenance by homeowners. 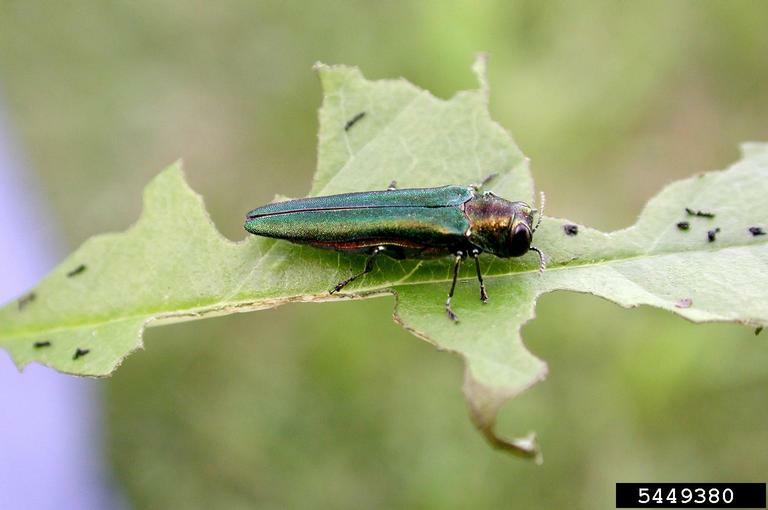 The Emerald Ash Borer (EAB) is a newer threat to New Jersey’s tree canopy. It was first discovered in NJ in Somerset County in 2014. It now poses a distinct threat in Mercer County. The EAB is a small, metallic emerald green beetle with a bright red abdomen which is native to eastern Asia. While in its native habitat it is not considered a pest, in North America it is highly attracted to our native ash species and readily overwhelms our local ash’s defensive compounds. Compound this with a lack of natural predators and we have a recipe for disaster for all North American ash species. First found in Michigan in 2002, it has now been found in 7 NJ counties, including Mercer. Infestations have killed millions of ash trees since 2002. It’s potential impact can be compared to that of the Chestnut Blight of the early 1900s, Dutch Elm Disease in the mid 1900s, and the Woolly Adelgid on our hemlock populations first found in the fifties and that we are currently managing. Of note about all of the infestations is that they originated in the U.S. following the accidental importation of non-native pests or diseases. It follows that we should carefully review our use of non-native plants in the landscape. This Forest Health and Economics page covers the issues that threaten northeastern forests from invasive insects and diseases to invasive plants and details programs and services that assist in their treatment and management. Check out the NJDoA site for information about the issue targeted at homeowners and municipalities. West Windsor Township’s Emerald Ash Borer Management Plan. Kiss Your Ash Goodbye… The Emerald Ash Invasion Is Here: Forewarned Is Forearmed.